With mountains of boxes filling your new office space, the unpacking process can quickly become overwhelming. Creating a strategy will help alleviate the stress of the move while also speeding up the process of setting up your new space in an effort to minimize downtime. The key, however, to focus on unpacking the right boxes first to get the essentials out and your business resuming as quickly as possible. The first box you should open once arriving at your new office location is the box that contains all of your first aid and safety supplies. This is particularly important if your employees will be helping you complete the move while on the clock. It may even be the law, depending on where you live. So, make sure the first aid kits are out and available before moving onto the next boxes. Comfort is key to a successful unpacking process. Make sure one of the first boxes you unpack at your new office location has all of the toiletries needed for an enjoyable and hygienic unpacking process. It’s a good practice to clean the new office space prior to unpacking the larger items. If you have not hired professional cleaners to come in and perfect the area for your arrival, label the box housing your cleaning supplies as high priority. This will allow you to quickly access the contents of the box so you can give the area a quick yet sufficient clean which will be significantly easier to do when the space is empty. Boxes that house any hazardous materials should be one of the first boxes to open when you arrive at your new office. While you may not be using them right away, doing so presents you with the opportunity to safely store them in the proper location to avoid potentially dangerous situations from occurring throughout the moving process. Keep in mind, hazardous materials cannot be moved in a moving truck and you will have to find alternative transportation for such items. From computers to printers, fax machines, photocopiers, and your IT infrastructure, these are the items you’ll want to unpack and set up fairly quickly upon arrival at your new office location. They’re essential to the business operation and if you run into any discrepancies during setup, you’ll want to have ample time to fix them to avoid any additional delays and downtime. Additionally, unpacking and setting up these often times large items will free up floor space which can help minimize the risk of injury while unpacking the rest of your office. Your office equipment may not be in boxes but they’re certainly the next on the list of things to unpack and setup. Take a look at your floorplan and begin to move office equipment to their assigned location. You do not have to assemble them right away but simply placing them in the proper place will help keep the unpacking process organized. Boxes that contain smaller items that are essential to the operation of your business should also be one of the first few boxes you unpack. From writing materials to stationery, staplers, tape rolls, these are all items you’ll need to have access to as soon as the business is back up and running. 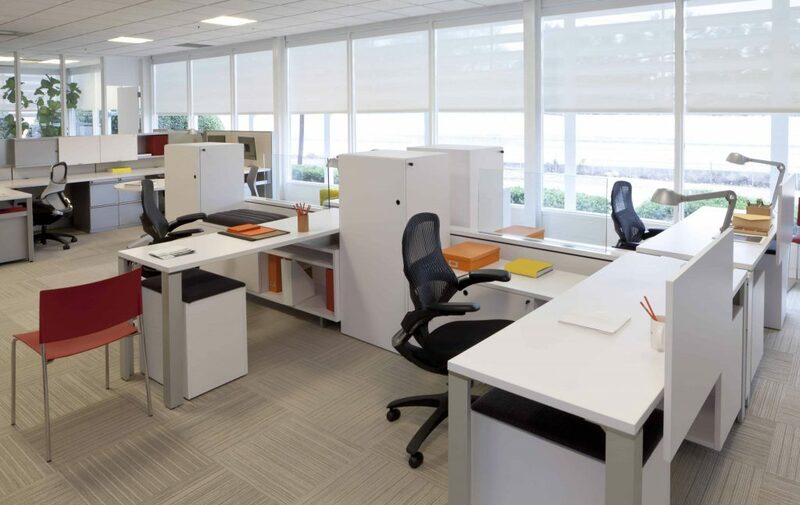 Though, you may want to assemble office furniture, such as desks and cubicles first to keep the process clean and organized. Being able to choose the right boxes to open first depends highly on the labeling system you used when packing the boxes prior to the office relocation. If you want everything unpacked, re-assembled and set up as quickly as possible, opt for professional moving services. Bekins Moving Solutions will dedicate the time needed to get your office equipment delivered, unpacked and set up in a timely manner so you can resume business as quickly as possible.